Price: $10990 - A great value, ready to go! 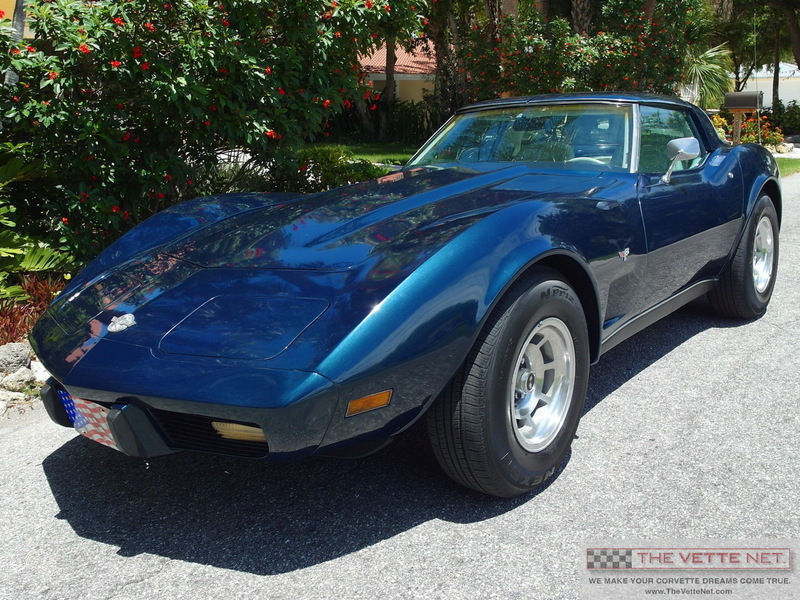 This Blue 78 Coupe came from the factory with the optional L82 engine, but we got it without it. A newer engine was installed, a L81 350 from a 1981 Corvette with 80K miles. The top of the engine was freshened up with new plugs, seals... all tuned up feeling very peppy, responsive and exhibiting lots of power. AC was just redone and blows cold, new "spider" valve installed in dash. New Edelbrock 650 CFM carburetor, new air filter. new tires on factory polished Aluminum wheels. It just received a new paintjob in the original Dark Blue metallic, base coat, clear coat. As seen in pics, car was completely stripped to gel coat, all imperfections taken care of. Paint is not perfect, but pretty darn nice. Interior has been completely refurbished, carpet cleaned and re-dyed, seats were taken apart, hardware completely rebuilt, seat covers restored and re-dyed to original color. Car drives exceptionally: engine is happy and responsive with immediate torque at low RPM, being helped by the long tube headers and straight 2.5 inch exhaust. We estimate the power at around 300 HP which propels this little Blue Rocket like a bat out of hell... As mentioned, AC blows cold, vacuum operated headlights work well, gauges work (minus clock). As with all these cars, a lot was invested and it seems one is never done... In the spirit of full disclosure, here is what is left to the next owner: radio is present, used to work but it is disconnected. Glove compartment door could not be properly aligned and is now shut close. The T-tops' weatherstripping could use replacement... Other than that, here is a nice little 78 that is ready for drive and show, a great value for the money. Offers are considered.